A-PDF Password Security Service is a windows service program which is running in the background. 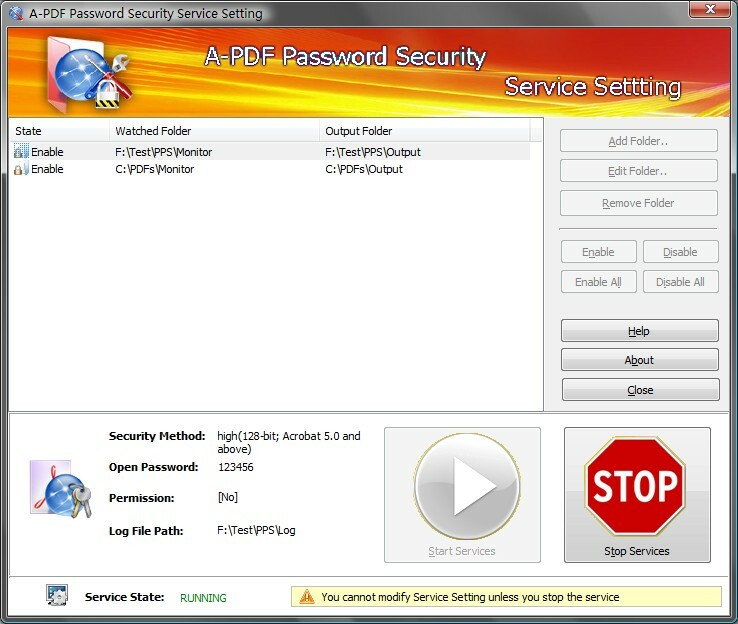 The A-PDF Password Security Service monitors multiple folders you specified. As PDF files copied or created in the folders, their password sercurity will be changed according your setting. 40-bit RC4 encryption, which is supported by Adobe Acrobat 3.0 or above. 128-bit RC4 encryption, which is supported by Adobe Acrobat Reader 5.0 or above. You can also remove the standard password security from protected PDF files. Supports 40/128 bit RC4 and 128 AES encryption. Note: you may get a password prompt to open the file. If you have no idea what password is, the program can not find passwords automatically for you, you may find a PDF password cracker tool here. With A-PDF Password Security, you can set a PDF file to require a password to open, and/or restrict access. For example, to allow or not allow printing, copying content, changing the file, etc. A-PDF Password Security Service is a standalone program costing only $99. It does NOT require Adobe Acrobat Pro, which costs hundreds of dollars. Qweas is providing links to A-PDF Password Security Service 3.3 as a courtesy, and makes no representations regarding A-PDF Password Security Service or any other applications or any information related thereto. Any questions, complaints or claims regarding this application A-PDF Password Security Service 3.3 must be directed to the appropriate software vendor. You may click the publisher link of A-PDF Password Security Service on the top of this page to get more details about the vendor.